Welp. I know what job I can never do. And that’s be a tower crane operator. To even start operating a crane, the guy has to make the scariest climb up the entire thing while carefully switching platform ladders and making sure his sweaty palms don’t slip. Not to mention he has to ignore how high he is in the air while being totally exposed to the elements. Yeah, I’m totally fine with never being able to do this. This is a crane at Yonge and Eglinton in Toronto. 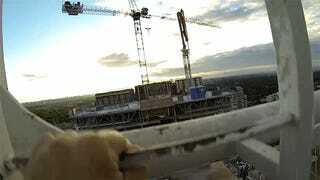 The building is around 30 storeys at the time of this video.